There's this artist on the Twitter and the Pixiv who, over the span of several years, has published numerous illustrations of "Girls with Guns" doing fan-friendly type things. The artist does draw other things as well, including a fair amount of TYPE-MOON stuff, but the "Bionic Joshi Kosei" seems to be one of the more successful original characters in FP Works' ARMS NOTE portfolio. So much so that there's already a Figma of the character, and now pre-orders are available for a 1/7th scale figurine scheduled for release later in October 2018. The Bionic JK figurine is listing for ¥17,900 (something like $170), which seems sort of incredible to me, but possibly (probably) I'm just completely out of touch when it comes to how much these sort of things cost in general. 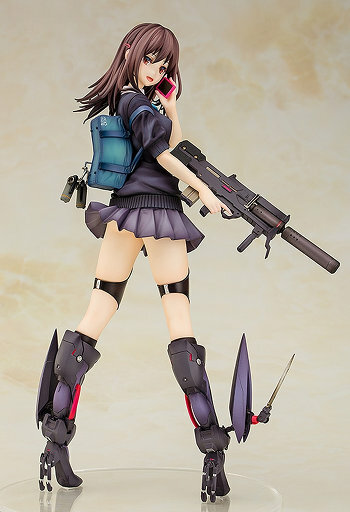 In any case, I'm all in favor of supporting artists who promote their original works, particularly when they're delivering GAME-BREAKING HOME RUNS, so I encourage all y'all to get in on this if girls with guns and collecting anime figures both intersect with your particular interests. It's only $170. What else were you gonna do with that money anyway?